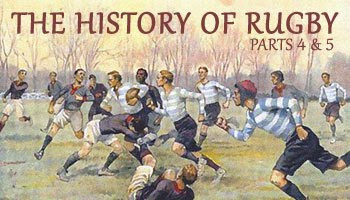 While the first few parts of the History of Rugby series were focussing on how the sport came to be, and the development of it thereafter, today you’ll see that the footage now goes through the decades and features Test series from 1920 to the late 1950’s. It’s fascinating viewing as you get a chance to watch select highlights from the biggest matches each side of the second world war. You’ll get to see moments such as Wales beating England at Twickenham in 1933, and South Africa touring and beating New Zealand in a series in that same year, in what was a tour that at the time, defined the best team in the world. Wales beat the touring All Blacks in 1935 in a classic Test , before the British Lions head down to South Africa in 1938, losing the first two tests but winning the third. If you ever wondered how old the tradition of selecting an uncapped player for Barbarians matches is, you’ll find out as we see footage from the 1948 game against the touring Wallabies. Wales were impressive in the fifties, winning the Five Nations, then the Grand Slam, and then beating the All Blacks at Cardiff Arms Park in 1954. It was the only loss of the All Blacks tour though, as they beat all other challengers. France later became the first side to win a Test series in South Africa in that century, as they did so before following up with a Five Nations win the next year. Ireland dampened the occasion slightly though, with a great victory against the champions. It’s absorbing to watch and for the rugby purist out there, well worth getting into. Today I’ve chosen to post two parts together, which will hopefully make it more worthwhile. Enjoy. lol its funny to hear them say that 13 stone is heavy for a wing!! 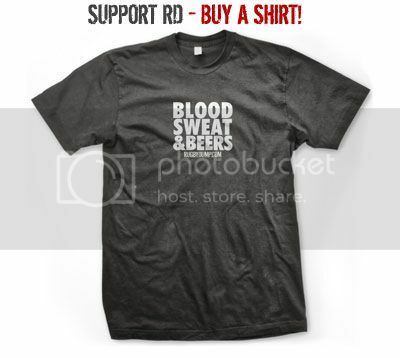 how many more of these will there be RD? A few more I reckon. They're only up to 1960. I love the shot of the barbarians hoisting up some of the All Blacks after New Zealand's victory. Love the sportsmanship. Its like beer league rugby. Guys not switching at the right time. Players milling about and walking back to position. In their defence the field is very muddy and the ball looks like a medicine ball. Anyhoo we've come so far in terms of physicality and gameplay. Low scorelines seemed to proliferate back in those days. Beer League Rugby works for me!! !Dont knock it til you have lived it!! It was much easier to shut the game down, kicking for touch from anywhere, sixty lineouts not uncommon, killing the ball in rucks, defence only needing to keep in line with the ball at scrums etc. Boggy paddocks and three point tries. Even more than now, it needed two sides with the same attitude to get a really open game. I think that's why the end-of-tour Barbarians games were so popular back then. The Rugby Club Plays of the Week - Bam Bam!